Here's a really cute gift idea for a guy who plays snare drum in the marching band, percussion in the symphony or even a full drum kit in a rock or jazz band. The drum boy personalized Christmas ornament will look just as good decades from now when it's a cherished memento of these years. These musical instruments ornaments personalized from Russell Rhodes can be customized with his name printed or painted by hand in a font more handsome than the one shown for clarity. We'll add a special message on back at your option. 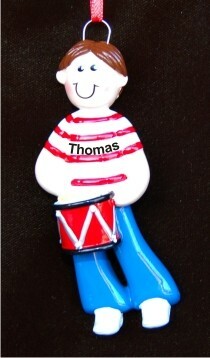 The boy drummer personalized Christmas ornament is perfect for birthdays, the holidays or to celebrate a successful performance. It arrives in our velvet drawstring pouch.